David Matuszak is a native Californian who began surfing in the early 1970s at Huntington Beach. By 1980 (nearly a decade after San O’ opened to the public), he discovered the unique surfing culture at San Onofre and made Old Man’s his second home. Some 30 years later he embarked upon a 6-year odyssey to chronicle San Onofre surfing history and culture. Drawing upon academic skills and his experiences in surf culture, he utilized a format in surfing that he employed decades before in his California Gold Rush history, Nelson Point: Portrait of Northern Gold Rush Town. Both are thorough examinations of two very different pioneer California cultures: 49ers and surfers. In Nelson Point, Matuszak wove together the words of 49ers to describe the entire Gold Rush experience. In San Onofre, he uses the memories and photographs of San Onofre’s pioneer surfers to tell the entire story of surfing. Matuszak weaves together those surfing memories into a narrative that offers historical and cultural context. At 1488 pages, San Onofre is the most comprehensive study of surfing ever attempted. Matuszak taught biomechanics and exercise science for 40 years. He now spends winters on his horse ranch in the foothills of the Big Bear Mountains where he trains working cow horses. And he spends time at his surfing hide-away on the Baja frontier. Each summer he retreats to his log cabin that he built on a Gold Rush homestead in the Sierra Nevada. He is an avid outdoorsman, buffalo hunter, miner, snowboarder, skier, and surfer. Matuszak is a member of the San Onofre Surfing Club, Hawaiian Surf Club of San Onofre, and Longboard Cowboys. You can often find him sliding a wave at Old Man’s. No other surfing location better defines surfing culture than historic San Onofre. 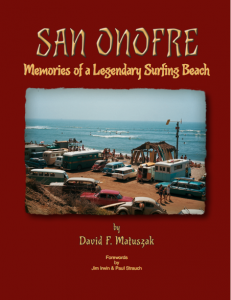 San Onofre: Memories of a Legendary Surfing Beach is a landmark study of surfing culture and history from its origins in Polynesia, Peru, and Africa, to the role that San Onofre played in molding Southern California surfing culture. When Whitey Harrison, Jimmy Daum, Bob Jacobs, Johnny Waters and the rest of the Corona del Mar surfers transitioned to San Onofre in the 1930s, they began a surfing culture unlike any place in the world. San Onofre not only chronicles the accomplishments of surfing’s icons, but it sheds light for the first time on the common surfer, the unsung heroes of surfing who established the sport as among the greatest recreational pursuits in history. Obscure, “regular Joe” type surfers whose names would otherwise be lost to history tell the story in their own words of the evolution of Southern California surfing. Because those pioneers surfed at multiple locations up and down the California coast, they referenced the most notable surfing spots, including Corona del Mar, Malibu, Huntington Beach, Newport Beach, Doheny, La Jolla, Swamis, Palos Verdes, Ventura, Santa Barbara, and Santa Cruz. San Onofre is the story of California surfing culture as seen through the eyes of the surfers and their families at San Onofre Surf Beach. Pioneer surfers tell their own stories of the Golden Age of Surfing and illustrate their tales with never-before-seen vintage photographs from their own family photo albums. Their stories offer a priceless collection of primary source data for future studies of the sport. San Onofre is more than just a study of surfing culture. It is a history of the place called San Onofre, located at Camp Pendleton, and the various cultures who inhabited its shores from the beginning of time. San Onofre offers a unique opportunity to examine the relationships of those cultures with one another. Beginning with the indigenous Native Americans and the Spanish colonizers, each culture is examined for their contributions to the history of the place and conclusions are drawn regarding their propensity to ride waves. By 1942, a distinct collection of sub-cultures co-existed at San Onofre alongside surfers: cowboys, farmers, fishermen, and Marines. The interactions between those sub-cultures offers a classic study in the ethnic and cultural diversity of California. Every aspect of surfing culture is examined in San Onofre: surfing’s origins, the early routes to the coast traveled by surfers, and the surf vehicles that carried them there, music, literature, art, language, surfing apparel, surfing equipment, religion and the ethos of surfing, types of wave-riding, the evolution of the surfer as America’ icon, virtually every aspect of surfing culture is explored. Primary source data is woven into a narrative that places pioneer surfers’ memories and photographs into historical and cultural context. In summary, San Onofre surfing culture offers a microcosm of California surfing culture that influenced the evolution of surfing and pop-culture worldwide. No other surfing location has contributed so much to both surfing and the California experience. The scope and magnitude (1488 pages) of San Onofre make it a valuable resource for surfing research in most any discipline.